Immunogen: Synthetic peptide corresponding to the sequence near the C-terminus of human Stat5α. Scientific Background: The signal transducer and activator of transcription (STAT) proteins serve as both cytoplasmic signaling and nuclear transcription activating proteins. STAT family proteins are comprised of an N -terminal domain that facilitates binding of cofactors, central DNA binding and SH2 domains, and a C -terminal transactivation domain. In response to a specific cytokine signal, STAT proteins are phosphorylated on conserved tyrosine residues. Phosphorylated STAT proteins dimerize via their SH2 domains and move to the nucleus. The STAT dimers bind to specific DNA elements resulting in transcriptional regulation of downstream target genes. STAT5 consists of two highly related genes encoding STAT5α and STAT5β proteins, which are 96% similar at the amino acid level. STAT5 is activated by phosphorylation at Tyr694 (STAT5α) or Tyr699 (STAT5β) in response to prolactin, growth hormone, thrombopoietin, erythropoietin, GM-CSF, IL-2, IL-3, IL-5, IL-7, IL-9, and IL-15 signals. Studies in knockout mice indicate STAT5α is the principal mediator of mammary gland development and lactogenesis. 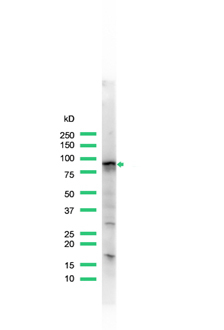 Western Blot analysis of K562 cell lysate with Stat5α pAb. 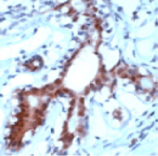 Immunohistochemistry analysis of breast carcinoma stained with STAT5a pAb.